Such an exciting life but yesterday a bonus! It was a really nice day here, 20ºC although a bit windy. Such is my world that I had to take a trip to the Staples office supplies store in Parchal to buy a new shredder, my old one having expired after 20 years of loyal service. 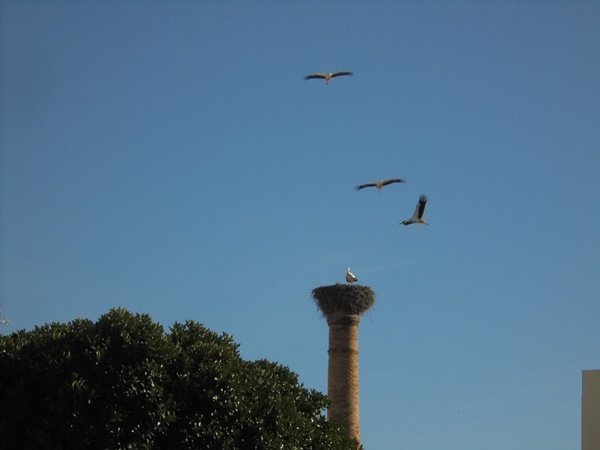 Parchal is across the river from Portimão and about 1 mile /1.6km) from the popular little town of Ferragudo. 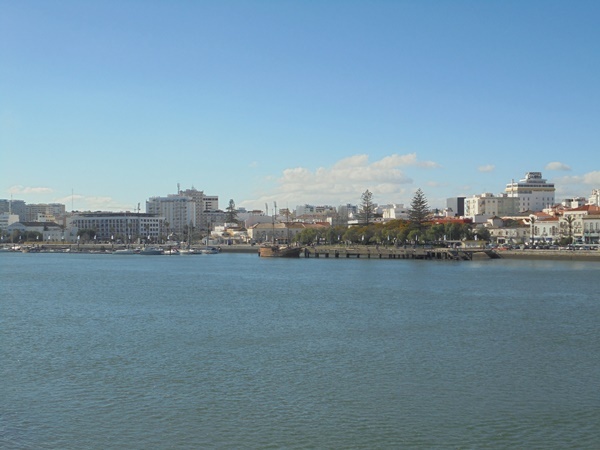 First some pictures looking across the river towards Portimão. Sun shining, a good day. The railway bridge over the Arade river. The Largo do Dique and Jardim (garden) area in Portimão centre. The riverfront and part of the city centre behind. Clouds shrouding the hills around Monchique, the highest point is almost 1000 metres above sea level. The little station at Ferragudo – Parchal where I was waiting. A café / bar occupies the left hand side of the building. The classic design of the early 20th century stations here. There would have been two tracks when originally built. In fact it was the end of the line until the bridge was built across the river in 1915. 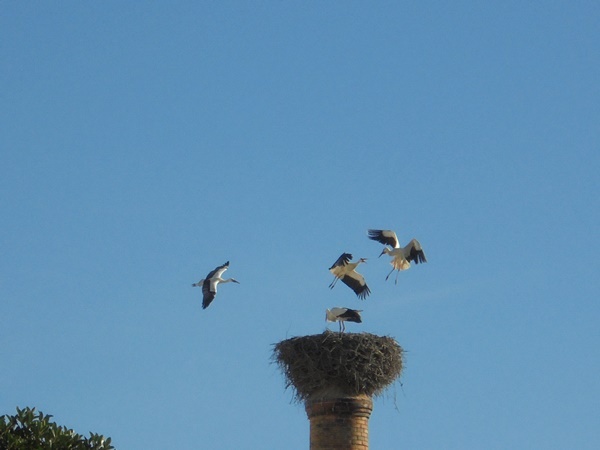 About a dozen storks gave a flying display while I was there. 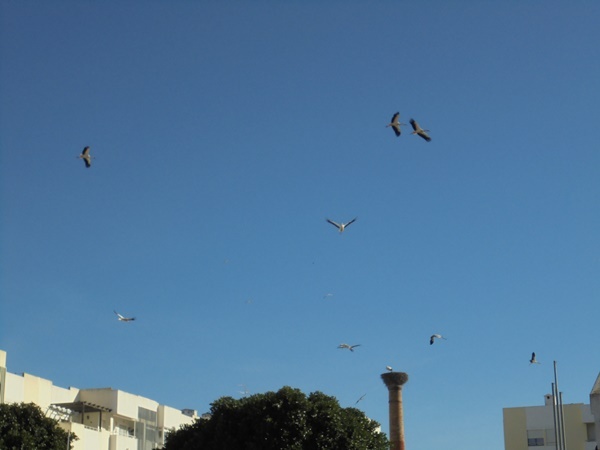 I cannot recall seeing so many in the air at one time. 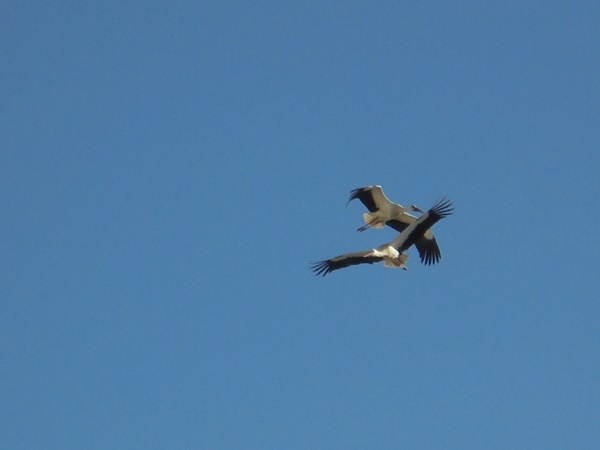 They clack their beaks together in some form of communication, easily heard over quite a long distance. Went to Portimão on a bit of business but also to visit the museum. On the way walking there I spotted a couple of things of interest. and the old bridge still carrying heavy traffic almost 150 years after it was built. The Portimão museum is housed in an old sardine cannery on the riverside. Its exhibits focus mainly on that industry, which all but vanished in the 1980’s. It was rather dark in places but I did manage a few pictures which are here. If you are the city it’s worth an hour or two of your time. Opening times (except August) are Tuesdays 1430 – 1800, Wednesdays to Sundays 1000 – 1800. Closed Mondays and national holidays. In August, opening times are Tuesdays 1930 – 2300, Wednesday to Sunday 1500 – 2300, closed Mondays and national holidays (the only one is 15th August) and admission is free between 1500 and 1900 on Saturdays. Admission €3 for adults, reductions available for children and seniors, it’s free on Saturday mornings except in August when it’s not open until 1500. It’s located on the riverside not far from the two bridges and Largo do Dique at Rua D. Carlos I by the big crane. Bus stops from near and far are 200 metres away, parking likewise. The stencil machine in one of the pictures was made by the Ideal Stencil Machine Co. of Belleville Illinois, which was in business from 1911 to 2002 I read. One of the machines in the dark was the evil device that made the keys for opening the tins, which to this day I am usually unable to use without getting sardine everywhere. One display mentions the men who soldered the lids onto the cans. It said that a skilled man could do 100 an hour. There were riots and strikes when machines were bought in to replace them. Just a short trip for an afternoon out. There was a cruise ship in town, the Seabourne Quest, 32,348 tons. Ship carries 456 passengers in some luxury I should imagine! I was unable to get too close because of the security. An event was being laid on for the passengers, who seemed mostly French. Local estate agents were occupying some of the tents. Musicians were setting up a stage behind where I was standing. Also docked was the replica French sailing frigate L’Hermione. This isn’t my picture. Large crowds waiting to go on board blocked my view. I didn’t have time to spare unfortunately. 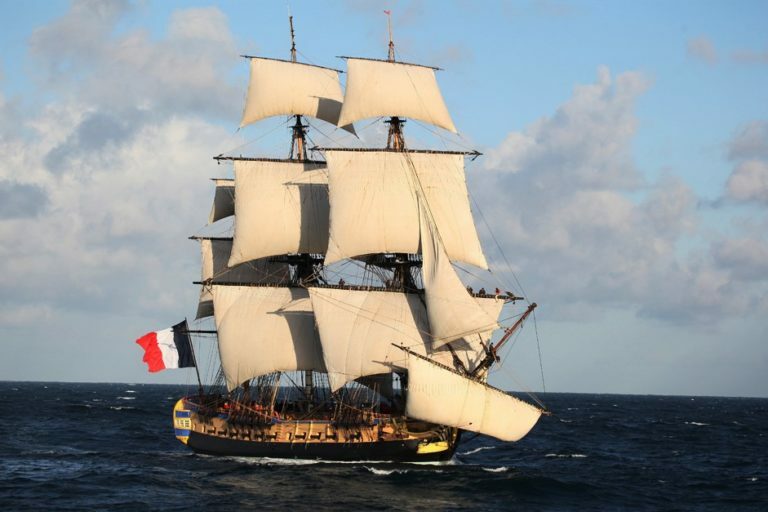 The vessel is a replica of the frigate of the same name that carried the Marquis Lafayette from France to the not quite USA in 1780, where he joined the War of Independence on the American side. Later in his life he was in command of the National Guard at the time of the French Revolution, but was imprisoned for five years by the radical elements. He was later offered the ‘job’ of dicator, which he declined. As one does. The ship will be visiting various locations in Spain and France until June 16th. In a disused part of the dock, a stork has made its next on top of a old crane job. Nearby is a part of the conveyors that were used to transfer fish from the boats into the factories that once lined the river. All gone now. 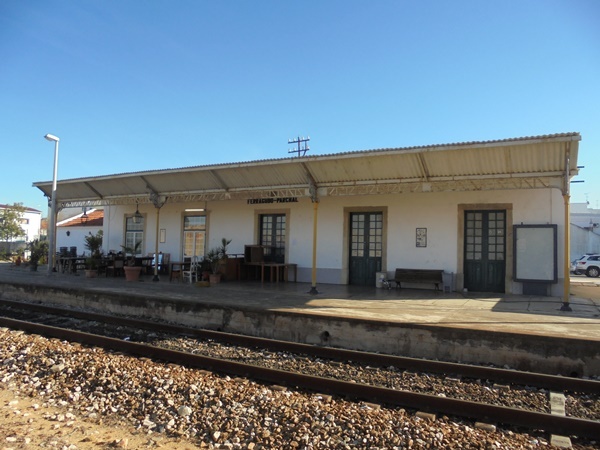 The Portimão museum is located there now. View of Portimão from down by the dock. 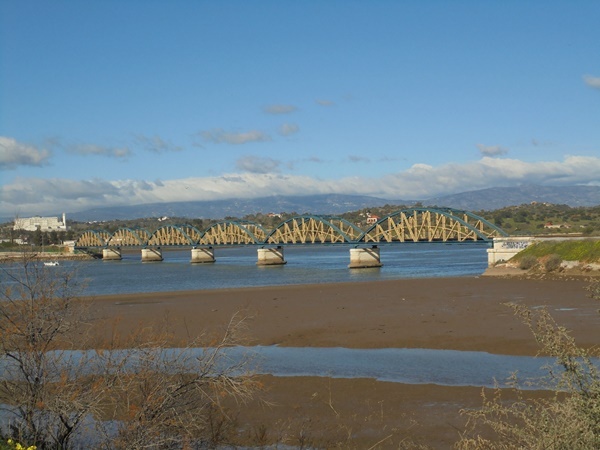 The railway bridge built in 1915 is 330 metres long, carrying the line across the River Arade. 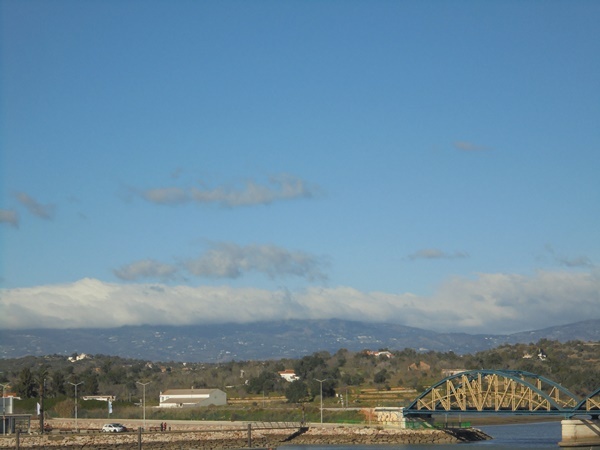 And finally, a view across the river to Ferragudo. I haven’t been to Monchique for years, so after a day indoors on Sunday, I decided to go out for the day. Monchique is popular destination for visitors. It sits in the hills, about 25km (15.5 miles) north of the city of Portimão. It’s at an altitude of about 450 metres (1500 feet) above sea level. Nearby, about 8km (5 miles) to the west, is the highest point in the Algarve. Called the Foia, it is a tall hill 902 metres (2960 feet) above sea level. On a clear day, there are 360º degree views for many miles. I could not venture that far, but took a walk for about an hour up towards the higher points. There are some very steep hills! I went up following a road and came back down much of the way following a footpath, which became narrower and rougher the further along I was. Don’t trust Google Maps, they mark it as if it were a road. Even a tank wouldn’t have managed the last section. I took a train from Albufeira to Portimão, then a bus for the 40 minute trip to Monchique. It’s a pleasant ride, once out of Portimão’s fairly dreary suburbs, with the last few kilometres on a very windy road, twisting and turning its way up into the town. I passed these traditional buildings on the way, picture was taken through the window of the bus. Once were storehouses, now like dso many farms around here, abandoned and falling into ruin. Monchique itself has a population of around 2,300 with a total of 6,400 in the council area. This is less than half what if was 80 years ago. As a result of the flight, there are many empty and abandoned buildings in and around town. In contrast, there are many newer properties in the hils of the highest quality. The town is a nice enough place, but there’s not much to actually ‘see’ except for the views down the valley to the sea and of the wooded hills around. The hills leading out of town are very steep indeed, but the views are rewarding. I was glad though to view this from the other side of a strong fence! Once on the downhill way, I went along a footpath through woods with more butterflies in one place than I have seen for a very long time. Almost total silence, just the industrious buzzing of other insects. Back in town, the relative peace was broken by the clatter of the civil protection helicopter coming in to land. That is a reminder that several large forest fires have affected the area in recent years. The current hot, dry and windy weather is keeping those responsible on their guard. The rest of the Monchique pictures are at https://1drv.ms/f/s!Am0w7qp9HCpqgshdzNsDLKwe4M5-Hg. The Caldas de Monchique (hot springs) arae about 6km (4 miles) south of the vilage itself, alongside the main road. Their properties have been known since Roman times. A large health spa and resort now dominates that area. The sun was shining, it was a hot day already at 1030 in the morning and there were plenty of people enjoying the riverside walk. The Jardim (Garden) do Bivar is a large open space where once stood a palace and barracks. Rest of the Portimão pictures at https://1drv.ms/f/s!Am0w7qp9HCpqgshe9ME5IljIdiE-uw. How to get to Monchique by car. 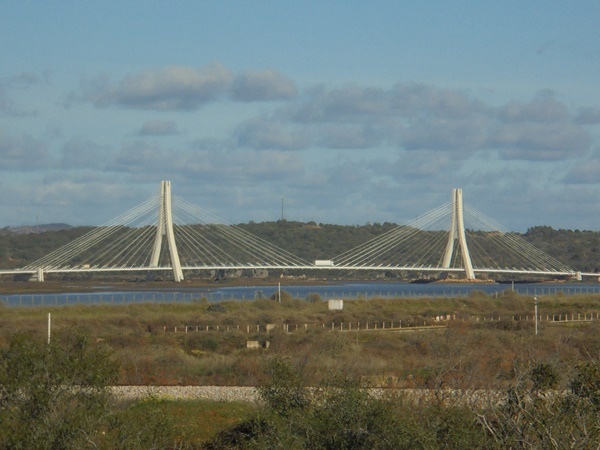 Easy – head towards Portimão on either the A22 or N125 roads, then turn north onto the N124 then the N266 road, which are well signposted. Car parking is on the edge of town, there is nothing in the middle. It is possible to drive all the way up to the top of the Foia and join the bus loads of tourists up there. 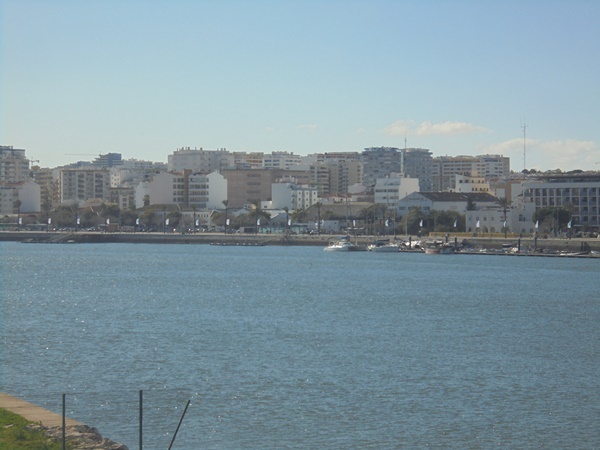 The bus stop in Portimão is by the river near the Jardim do Bivar pictured above and about half a mile (08.km) from the cruise ship dock. A taxi for that distance would be around €20 on weekdays, €25 at weekends. There is no longer any regular bus up to the Foia, but taxis are available in Monchique. As I said, Monchique is very hilly, most of the streets and footpaths are of cobblestones and many are very steep. Those with walking difficulties will have problems. The town centre has a number of cafés, bars and places to eat generally plus a few souvenir type shops. The are three lots of public toilets, unusual for a small town. Edited Sunday 10th April. Somehow the pictures in the linked folder below deleted themselves. I have put them back. I went to watch the football at Portimão on Wednesday afternoon and had time before my bus back home to take some pictures down at the waterfront. A small collection from Portimão taken on Wednesday afternoon, 22nd August. Mostly around the Largo do Dique and riverside. I have been to Portimão many times and have never spotted these excellent historic maps. They are in the garden next to the football stadium, pretty well in the city centre. They are hand painted on tiles. The series of maps shows the area from the 2nd Century to the present day, although there is a gap from 1600 to 1924. Perhaps I missed some? Take a look at this interesting record. Click ‘view original’ on the top menu bar to see the full sized version.